This post was originally published on February 26, 2016 and was updated with new information on August 30, 2017. Integrated project management (IPM) is a ubiquitous term in project management literature. You’ve likely come across it dozens of times in your career as a project manager. It is a weighty term; the IPM approach impacts much of what we think of when we think of project management. Yet, despite its ubiquity, integrated project management is seldom well understood. You might have a general idea of its implications and core tenets, but the details escape you. Like so many concepts in the creative world, it can be downright difficult to separate the multitudinous ideas that get bandied about daily. So really, what does IPM actually mean? In this article, I’ll give you a clearer definition of integrated project management. I’ll share the core concepts and help you adopt IPM practices in your work. Integrated project management is the collection of processes that ensure various elements of projects are properly coordinated. It establishes and manages the involvement of all relevant stakeholders and resources, according to defined processes devised from your organization’s set of standard processes. Finally, it involves making trade-offs among competing objectives and alternatives to meet or exceed needs and expectations. Integrated project management aims to work at an organizational scale. Far too often, project management knowledge remains siloed in individual departments at a business. How IT manages its projects is rarely shared with the Product team’s approach. Which is to say, integrated project management describes a way to understand, collect, share and implement project management knowledge and best practices across the organization. Sounds simple enough, right? Putting it into practice, however, presents a challenge. In the next section, I’ll share some more details on the integrated project management approach. The project charter is usually the first step in integrative management. This is a statement of the scope, objectives and participants in a project. The project charter is "ground zero" for the project. It provides all stakeholders an initial delineation of the roles and responsibilities of different resources. It also outlines the objectives of the project and identifies the key stakeholders. Finally, the project charter defines the authority and responsibilities of the project manager. Developing the project scope is usually the second step after outlining the project charter. This is where you specify the goals and objectives of the project. To recap, goals are long-term aims of the project (such as "increasing social shares"). Objectives are narrower and define exact milestones (such as "implement social sharing buttons"). Think of the project scope as the document outlining the broad ambitions and specific targets you hope to achieve with the project. The project management plan documents all other plans and processes associated with the project. Think of it as the "plan that defines all plans". In this plan, you'll document all activities you need to define, prepare, integrate and coordinate subsidiary plans together. For example, you might have separate plans for engineering and design teams. The communication protocols, knowledge-sharing processes, risk management processes, etc. for each of the two teams will be defined and integrated into the project management plan. The project management plan is just that - a plan. You also need to direct and manage the execution of the project. 'Project Execution' defines the processes for executing individual components in the project plan. This is activity-centric and aligns with the project's key objectives and milestones. Measurement of activity velocity and performance becomes vital in project execution. In the execution stage, you measure the performance of the project. However, this performance doesn't exist in isolation; you need to measure it against an established baseline. The baseline is defined in the initial project plan. This is the prime aim of Project Monitoring. In this phase, you compare the project performance against your baseline on an ongoing basis. If there is a severe negative deviation from the baseline (the acceptable deviation is, again, defined in the project plan), you can modify the project accordingly. Circumstances and requirements change as the project progresses. Some resources become unavailable, some teams hold up delivery, and some stakeholders request additional changes. How you deal with these changes is defined by the Change Control document. This document is critical for getting stakeholders to buy into project integration. In complex projects with multiple stakeholders, resistance and conflicting interests are inevitable. When you’re making tradeoffs, a central document that establishes norms for managing stakeholder requests becomes extremely useful. Beyond dealing with changes, this document also defines the criteria for evaluating change requests and measuring their impact on the project performance. If a change request is deemed disadvantageous for the organization or the project, it can be rejected, delayed or deferred. The above section describes the components that make up an integrated approach to project management. To actually succeed with this approach, however, there are a few ideas and concepts you should know. 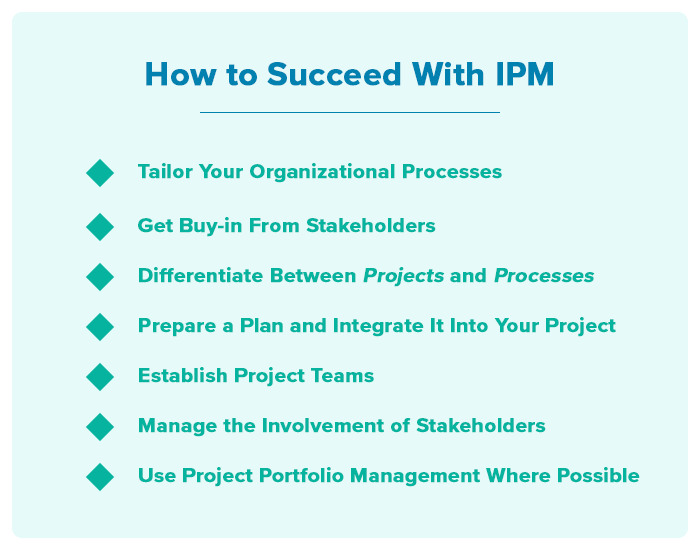 Tailoring your processes around each project is inarguably the first step in implementing IPM. The processes that are tailored around your agency’s established procedures are known as the project’s “defined process”. In real world terms, this means understanding the project’s requirements and overall expectations. Then factor in the project’s costs, schedules, risks, staffing and other factors that determine the project’s overall success. Usually, you’ll define all of these in the project charter. Once you have a clear idea of what the project demands, you can consider your organization’s established procedures. Pick out procedures that align with the project’s requirements. Use this to create your project management plan. Outlining a defined process will help predict, assess, and manage all necessary factors that will inevitably affect your project. An integrated approach to project management requires the approval and cooperation of multiple teams across several departments. You’ll have to deal with dozens of stakeholders - a key project management skill - and their objections and concerns. One of your first tasks, therefore, is to get stakeholder buy-in. Key stakeholders you need to get buy-in from. Scale of the project to get stakeholders excited about the project. Project objectives to give stakeholders an idea of the tangible results expected from the project. Constraints and concerns that might flare up during the project. Addressing these can help reassure stakeholders and get them onboard. Think of the project charter as a persuasive tool. Simply asking stakeholders to buy into the integrated approach is not enough; you need to show them the tangible benefits of the project and why they should care about it. The integrative approach to project management depends on organizing all processes and knowledge spread across the organization. To do this, however, you first need to delineate the differences between a process and a project. A process, by definition, is an ongoing, changing activity. Processes are usually repeatable and thus, scalable. A project, in the PM context, describes a multi-step activity with a definite end. Since a project is client-specific, it isn’t repeatable or scalable. One of your core responsibilities is to figure out whether a task belongs to a process or a project. If it belongs to the former, it can be codified and integrated across teams and departments. In case of the latter, it remains localized within the project or team. Once you’ve considered the requirements for your project, develop a clearly defined project plan. As I mentioned earlier, your project plan is your roadmap to success. Quality Assurance, Risk Management, Resources, Documentation, Measurement Plan, and Issue Management are all factors to consider. Luckily for you, project management software can help with this step, as it allows project managers to plan and monitor projects—from anywhere, at any time. The best software will create project timeline and tasks, monitor your resources, and provide you with the status updates needed to manage your project. Your resources are your most important asset—and optimizing your project teams can make or break a project’s success. Be sure to have specific organizational guidelines in place, including regular meetings and status reporting. As you begin to implement a project plan, it’s crucial to consistently check that all resources are on the same page. Again, project management software helps automate many communication processes. However, it’s important to make sure that your team is utilizing the software correctly. Pick a PM tool that offers adequate training to support your resources, such as Workamajig’s training videos. Sure, your project teams are crucial to the actual execution of a project—but if stakeholders are not involved during every step, a project is for naught. It’s your responsibility as project manager to coordinate and communicate project updates to the various stakeholders. Regular reviews and exchanges will help ensure that coordination occurs, and that everyone involved with the project is aware of its status. By defining your project’s defined process, you create formal interfaces with stakeholders that will help guide a project to success. No project exists in isolation. Even if it has separate teams, it is likely influenced by the rest of the organization. Project portfolio management is the process of grouping similar projects and managing them as a portfolio of projects rather than in silos. Think of it as a management process for project management itself. Portfolio management is particularly useful for larger organizations which might have dozens, even hundreds of ongoing projects at any time. Not all of these projects would align with the business’ long-term goals. With portfolio management, you can identify projects that can help you achieve your long-term strategic goals and manage them as a cohort. Integrated project management is the solution to haphazard management techniques and instinctive managerial actions. By understanding, sharing and codifying processes and knowledge across the entire organization, integrated project management brings a much-needed robustness to your project management approach. With an integrated approach to project management, you build a project charter, sketch out the project scope and map the project plan. You closely monitor the project and measure its performance against an established baseline. You also have a fixed process for dealing with stakeholders and their requests. Doing this gives you a broad understanding of each project and its requirements. It also helps you share knowledge and processes across projects, making for a healthier organization.